Hello everyone, we have been busy and wish to share several updates and feature releases with you today. 1. Supplemental Training - New Module! We would like to introduce you to supplemental training, a brand new feature for Informetica. Supplemental training allows Site Managers to track and store supplemental training information for their users and uppload supporting documents for the training. You can enter various details related to exisiting products in Informetica or external training (such as a course taken off site). Attach supporting documents such as receipts, photo IDs, certifications. If you would like to use the new supplemental training module, please contact me. Once it is set up, I would be happy to schedule a training session with you. Please find more details in this PDF file: Click Here. 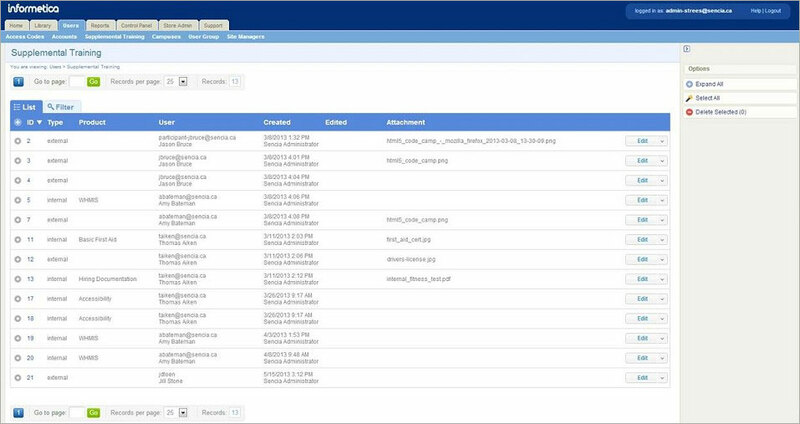 We have added the ability to archive users to the Organization Manager (Campus Manager) account type. If you would like this optional feature, just let me know. The system now supports attaching multiple Classifications (Disciplines) to single user accounts. Site Managers on systems that have this feature will also see a new Section menu item within the User Profile. This new feature is now on all Informetica systems. You may now have up to 10 product types (increased from 5) that can be managed by Site Managers. You will see a new option in your Control Panel called Product Types. From this page, you can create and edit the different product types and turn on or off the different asset types available for creation within each product type. Please contact me to set up training and/or supporting documentation if you plan to use this new feature. Sometimes a certification path is created after users have completed a product. Informetica’s Check Eligible Users tool lets Site Managers capture the users who qualify for the new certification and issue it. The system now applies the date of completion to the certifications rather than the current date. View an overview of a single product, generating a list of users enrolled to that product, as well as the date of enrollment, the date they finished the product, their enrollment status, and the number of days they have left to access the product. Please enter a SRS ticket if you would like this new report available on your system.